The starlight-travel-time problem has been a difficult issue for biblical creationists for a long time. Big Bang cosmologists also have their own starlight-travel-time problem but creationists have proposed various solutions to this problem in the past decade or more. Recently I proposed an expansion on a solution, first proposed by Jason Lisle, in an article entitled “A biblical creationist cosmogony.” It is somewhat technical so I thought I’d write a very short layman summary here. When God said He created everything in order that He did according to the Genesis 1 account then all those events occurred as the Bible describes on those consecutive 24-hour days about 6000 years ago. Lisle proposal is that those events were timed when the light first arrived, or when a hypothetical Earth-bound observer might have first observed them happening. And the main issue is the creation of the stars and galaxies, some of which lay tens of billions of light-years distant. So if we only consider the language of appearance, the light from those galaxies, and all stars, first arrived sometime during Day 4 of Creation week. Therefore travelling at constant speed of light (c), which means light travels 1 light-year per year, then it would have taken billions of years to get to Earth. 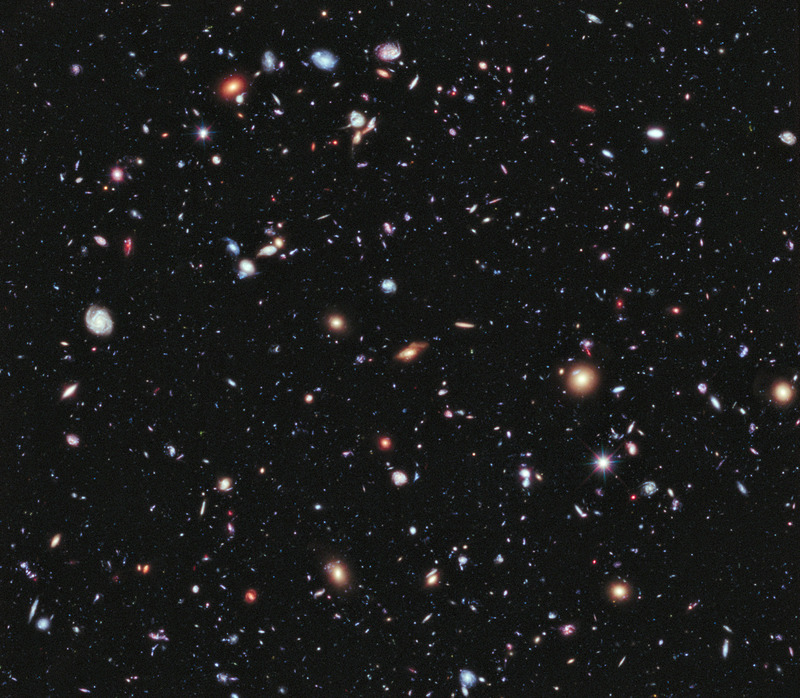 Therefore such a view of the universe requires that all galaxies were created at a time long before God created the Earth on Day 1 of creation week. But this is just language of appearance. A constant speed of light (c) assumes a certain convention of synchronizing clocks. We could equally have chosen another convention that simply times all events when they are observed. So when the light of the ‘newly’ created stars and galaxies arrives at the Earth on Day 4, it is truly the first light from the creation of those galaxies. In my view, the only question to answer with this model is: Is it compatible with Scripture? The following verse is the main test. The days must be 6 ordinary 24-hour earth rotation days. Exodus 20:11 For in six days the LORD made heaven and earth, the sea, and all that in them is, and rested the seventh day: wherefore the LORD blessed the sabbath day, and hallowed it. I believe that the language of appearance easily answers to this verse. Each day is time stamped from the opening of the day in the evening to the closing of the next day. Just because the events are timed by when the light first arrives at the earth does not introduce a ‘gap’ theory or any such nonsense. All days are consecutive and only 24 hours long as measure by local Earth clocks. See Table of events in The big bang is not a Reason to Believe! If we then suppose God made the universe we see now, only 6000 years ago, measured from when the light first arrived, then even though the light from the most distant galaxies took billions of earth years to arrive here, the light represents the state of those sources when it left. Hence we can say a young universe as time-stamped by when the light first arrived. Based on that timing convention the universe is only approximately 6000 years old, not 13.8 billion years old. That universe does not need to be stable, nor in any sort of equilibrium condition, as it only needs to remain long enough for God purposes. It may not be expanding; it could be even static or quasi-static. There is no reason to force an expanding universe on the Scriptures. Also I speculated that the redshifted galaxy light we see from distant galaxies could be due to a condition of that special creation. I now place this model at the top of my list even ahead of my own time-dilation model. The Lisle’s model has a lot of potential to solve vexing physics problems in the cosmos, and it does not have a starlight-travel-time problem. But I have not totally given up on my own model. It has several difficult problems and I am working to try to resolve those. See An update: Correspondence on cosmology. But please read through the articles listed below in the numbered order. Update Dec 2, 2018: I have now totally given up on my own Carmelian cosmology. I never found resolution to various internal problems it has. On top of that I realised that there is a second starlight travel-time problem for biblical creation that occurs well after Creation week, and it is when God curses the whole universe (I’ll publish an article on this soon). Any model that relies on relativistic effects in Creation week has another light-travel time problem that occurs after Creation week. Hi Dr. Hartnett, I appreciate the layman’s summary. I was a bit confused as to whether you were suggesting an actual infinite one-way speed of light or not (from the more technical articles). It sounds like you are not. My gut reaction on the language of appearance idea is that it stretches the biblical text too far – I’m in the middle of reading Sarfati’s book Refuting Compromise, which deals with similar notions regarding the Day-Age interpretation(s) of Genesis. I realize this is somewhat different, but many of the same issues come into play, such as why didn’t God just say “appear” as he did in Genesis 1:9? Ultimately I think the plain reading of scripture is that the entire universe was created in six days. I should add, how impressed I am, that you are humble and open-minded enough to look at these issues from different angles – exploring models that could potentially overthrow other models that you yourself put forth! You set a great example for all of us who seek truth and understanding. When you use the word ‘actual’ it forces us into more technical language. This is because it automatically assumes the ESC synchrony convention which means a finite 2-way speed of light. For an infinite 1-way speed cannot be measured so it is not the ‘actual’ speed. The only issue with Scripture is as I wrote. Is it the language of the Bible? I actually believe it is. Prior to the last 100 years man had no concept of a finite speed of light. All events were time-stamped by when they were observed. People would say ‘when they occurred’ but that really means when someone observed the event. The last verse here (1:16) does not have ‘he made’ in the Hebrew, so we should connect ‘And God made’ with ‘the stars also’. The language of time-stamping an event does not mean anything different from this language. Scripture clearly names the day this occurred and what occurred on that day. When you see something, anything, you might say it ‘appears,’ but the meaning of Genesis 1:9 ‘appears’ is that the land was below water; i.e. one might observe just water, then the dry land rose up and was visible. This model does not add a gap to Genesis 1. It is faithful to Scripture. I think we need to be careful we don’t restrict what Scripture does allow. That would be just as bad as adding what it does not allow. Thanks for your reply. Just to clarify, when I used the word “actual”, I didn’t mean to imply that ESC is THE reality: I wasn’t thinking “Relativistically” at all (I was thinking in terms of “absolute time”). Thanks for pointing out my disconnect. I have trouble grasping special relativity (SR) theory from a philosophical point of view, because of issues like this. I understand that there are plenty of experimental results backing the theory, but could those results be explained by something as yet unidentified? After reading Lisle’s paper on AIG, it seems that SR can actually throw the whole chain of cause-and-effect out of whack, if different observer-dependent frames of reference collide. Things like that lead me to consider that SR may either be partially wrong and/or incomplete. Notwithstanding, if I assume for a minute that SR is correct, then I think what Lisle’s ASC model is suggesting, is that the stars were created on day 4 of the creation week, within a 24-hour period of time, from the point of view of a hypothetical observer on earth. The light-travel-time was (nearly) instantaneous. In addition, the events in the cosmos should display a certain “youth” (~6000 years old) from our point of view on earth today. Some other hypothetical observer out in the cosmos may see things differently (due to a different observer-dependent frame of reference, or because they’re using a different convention), but that isn’t relevant to the model. Is that an accurate statement? But then I come back to my conundrum: Lisle compares ESC vs. ASC to metric vs. imperial measurement systems. So what would a hypothetical observer on earth see on day 4 of the creation week if that observer were using an ESC “ruler” instead of an ASC “ruler”? Your understanding of the ASC model seems nearly right. The light travel time is zero, i.e. instantaneous, not nearly instantaneous. It is because of the definition of simultaneity, i.e. when the event occurs is when the observer sees it. And yes, depending on which convention you apply, you get a different timing for the same sequences of events. I have tried to illustrate this in SUPERNOVA REMNANTS AND THE AGE OF THE UNIVERSE. Realise that a timing convention is not a cosmological model per se. It is a mere choice of convention. If you then construct a model, as Lisle has done–his ASC model–in which the timing convention of the Bible is the ASC, then you now have a model and a cosmogony (an origin of the universe model). On your last question, the answer is what I wrote in this article. Using an ESC “ruler” the stars were created at distances and hence times before Day 4 such that their light for the first time arrives on the earth on Day 4 of Genesis Creation week about 6000 years ago as measured by Earth clocks. You might imagine then galaxies billions of light-years distant were created, under ESC language, billions of years before Day 4. But as for those created closer to the earth, the time of creation advances closer to the moment of the creation of the earth on Day 1. It would have been like a creation wave moving inward towards Earth at the two-way speed of light (i.e. at the canonical speed, c), shells of galaxies, one after another being created, getting closer and closer to the earth. Thus for all galaxies their light arrives at Earth on Day 4 for the first time. But because we cannot measure the one-way speed of light, by convention, we can choose it to be infinite, under the ASC “ruler”. Hence using that language “of appearance” all stars were created, or made, when the hypothetical earth-bound observer saw their appearance for the first time, on Day 4. The Cosmos is huge, sure, but the Earth is the focus of God and Mankind’s attention. Atheists have made Earth just some ordinary planet in a vast outer space, but that is a wrong way of looking at it. If the stars were created several thousand or million or billion of years ago, due to the limitations of the speed of light, so be it. The Earth, Sun and Moon are only 6,000 years old. The age of the Cosmos should be defined by how old the Earth is, not some arbitrary, distant star. The stars were created for man, not man for the stars. We are Earth dust, not stardust. On creation.com, I recently ran across a creationist critique of Dr. Humphreys’ “New Vistas…” theory, and wondered how credible the critique is. It is titled “Errors in Humphreys’ cosmological model” by E.D. Fackerell and C.B.G. McIntosh. Are you familiar with this article? What is your take on it? Note: In one place, they seemed to be saying that it would make no difference whether the universe had a center and an edge–that with the standard F-L cosmology, you could pick any point to be the center. That seems to me to miss the point. The surface of a sphere is topologically different from a bounded disk. Gravitational forces between objects on the surface of a sphere would cancel one another because all points are geometrically equivalent, but with a disk, points closer to the edge of the disk would experience a net force toward the (unique) center of the disk. Isn’t that correct? That critique is quite old and Russ Humphreys himself has responded to it in detail in the same issue of Journal of Creation (previously named TJ). If you look in the same issue you’ll see a critique article of Humphreys model by Conner and Page, who are old-earth, big bang Christians, along with Humphreys’ response. I don’t understand your bounded disk argument. Humphreys’ model is a finite bounded sphere, with Earth near the unique centre. Conner and Page favour a finite unbounded sphere, which has no centre or edge. Humphreys rightly argues that the boundary conditions change the cosmology. But please read the linked papers. I mentioned the bounded disk as a 2-D analogue of the 4-D geometry. I normally think of Einstein’s 4-D space-time continuum as the 4-D surface of a 5-D hypersphere. By bringing it down to a 2-D surface of a 3-D sphere, I can better envision what he intended. Then I can compare it to a 2-D version of Humpheys’ model, which would be like a bounded, planar disk. Perhaps I’m not describing the geometry/topology in the best or clearest way. Thank you for the links. I’ll check them out. Mitch, I think the better analogy is the 2D surface of a sphere (in a 3D space) as an analogue to the 3D curved space in a 4D hyperspace. The time dimension can be suppressed for this. Mathematically, as you know, you can write this easily but the latter is hard to visualize. So Humphreys’ model occurs when one adds a central gravitational potential. It has some similarities to my model described in The Universe: Finite or Infinite, Bounded or Unbounded. There is a preprint to my IJTP paper, “A valid finite bounded expanding Carmelian universe without dark matter” (Int J Theor Phys (2013) 52:4360–4366), linked there. Certainly my way of describing the different concepts is there.